Civil Protection | SAMARITAN INTERNATIONAL e.V. Disasters can never be prevented completely and can affect everyone. Therefore, to cope with the consequences suitable precautionary measures have to be ensured to avert risks and to protect the persons concerned. Disaster relief requires short-term availablity of personnel and material resources. With increasing frequency of extreme weather sitations affecting whole regions, cross-border neighbourly help is even more necessary in civil protection than in rescue services. Flood assistance in Saxony 2013. Photo: ASB. Especially in cases of natural disaster, the scope of effects is hardly ever forseeable. That’s why it is essential to have sufficient personnel in form of volunteers, who are motivated, have been properly trained and can help according to need. 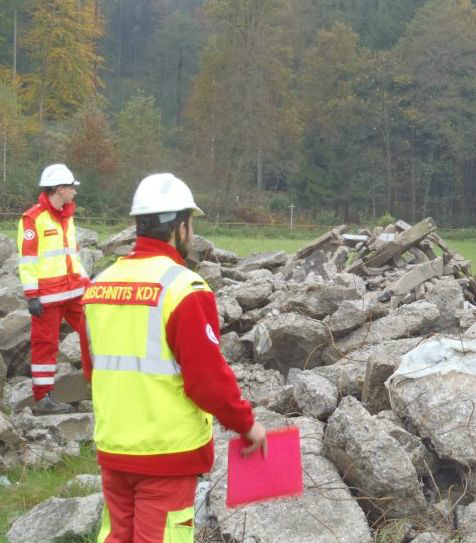 However, the national civil protection systems in Europe are very different in terms of operational structures and strategies – with the exception that they are all based to a large extent on voluntary services. SAMARITAN INTERNATIONAL tries to highlight this issue through the presentation of short profiles of national civil protection systems. 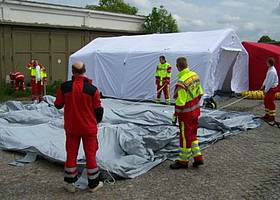 Civil Protection exercise Styrex with ASBÖ, WK and THW. Photo: WK. Organisations active in civil protection face additional challenges because of social and demographic change. Helpers are increasingly confronted with situations that require intercultural competences and foreign language skills, thus requiring multicultural teams to act jointly or complementary on these requirements in disaster situations. Also, in our fast paced times with high mobility requirements for employees voluntary civic commitment tends to have a lower priority for many people. The expansion of cross-border volunteer collaboration is therefore an important issue for the European Samaritan network, but not only because of the expected scarcity of resources and the social and demographic changes in an ever closer Europe. The member states of the European Union have decided upon extensive measures in order to guarantee mutual assistance between member states through increased cooperation in assignments in civil protection. With the international operation units of SAMARITAN-AID SAMARITAN INTERNATIONAL will be part of the EU mechanism, a new concept for better coping with crises.